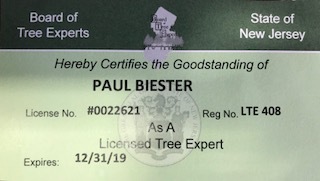 Almost a year has gone by since the NJ Board of Tree Experts passed the Tree Expert and Tree Care Operators Licensing Act. Registered business owners are receiving their official identification card. The card is available to present to clients to show they are in good standing with the NJ Board of Tree Experts. If you are obtaining several estimates for tree work on your property, be sure they all can produce one of these cards so you are comparing apples to apples.